Trent Kling was first appointed as an assistant professor in the PSU Department of Communication in 2012 before his promotion to associate professor prior to the 2017-18 school year. Trent has worked in radio, television, and media/public relations in one form or another since 2004, when he got his first job as a news assistant at KNSS Radio in his native Wichita, Kansas. He worked as the Media Relations and Broadcasting Director for the Amarillo Gorillas (Central Hockey League) and Amarillo Dusters (arenafootball2) in Texas before moving back to Pittsburg to pursue his Master of Arts in Communication in 2009. 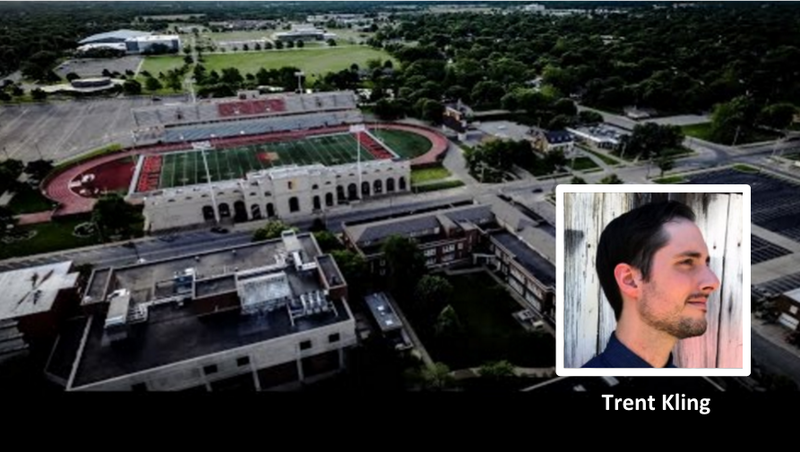 As a graduate student, Trent earned his Master of Arts in Communication in 2010, completing his thesis on early Kansas media and its coverage of locally important events. He continues to work in media as on-air talent for various sports and specialty broadcasts at MyTown Media, a regional radio group headquartered in Kansas. His work in sports play-by-play earned accolades at the 2016 Broadcast Educator’s Association Festival of Media Arts, where he was awarded Best of Competition for Sports Radio in the faculty competition. Trent is a member at Kling Family Orchards LLC, which oversees retail operations of Root Coffeehouse and value-added goods creation. He served on the Board of Directors of the Pittsburg Farmers’ Market from 2012 to 2015 and hosted a bi-weekly cooking show on KOAM-TV during that same time. In addition to broadcasting, he takes great interest in retail, Kansas history, horticulture, sports, and culinary arts. Trent is a two-time recipient of the “seniors’ choice” award for Outstanding Teacher in Communication (2013, 2017).